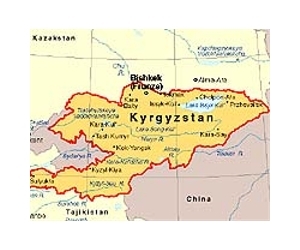 Kyrgyzstan's new leader said Thursday it was "very dangerous" for his Central Asian nation to host a US military base at Bishkek airport and that it must become a fully civilian airport by 2014. Kyrgyz President Almazbek Atambayev said he told visiting US Assistant Secretary of State Robert Blake that the annual users fee of $150 million which Washington paid was not worth the risks involved. "Perhaps they may think that Almazbek Atambayev is doing this under pressure from Russia," said Atambayev, a former prime minister who was elected president of the turbulent nation near Afghanistan last month. "This is not the case," he stressed. "We want to transform Manas into a fully civilian airport. And keeping a military base for $150 million is slightly dangerous. Not slightly, but very dangerous." The ex-Soviet republic is the world's only nation to house both a Russian and a US military base, reflecting a recent rivalry between Moscow and Washington in the energy-rich region.